Cooking on a boat when it might be pitching from side to side takes a lot of practice and it can be extremely dangerous if you don’t know what you’re doing. However, there are devices and methods which you can use to ensure that your stove is secure. A gimballed stove is one which you hang from pivots so that the stove remains level if the boat is rolling and it is the only safe way to cook if you’re going to be cooking on the move, especially out at sea. The idea is that the stove can swing freely from side to side at a greater degree than the boat can pitch. 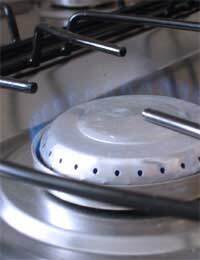 It’s also crucial that the fuel line is attached in such a way that it cannot get caught on the stove as it swings. However, you must also ensure that the stove has a lock on it before you take anything off it or out of the oven otherwise you’re likely to be scalded by hot food. It’s always better to have an expert fitter come and install the stove and explain how gimballing works. Obviously, in extreme conditions, you shouldn’t try to cook any liquid orientated meals such as soups or stews which can be present more danger to your safety. You should have a protective crash bar fitted to the front of your stove so that in the event the boat pitches, you as the cook cannot fall against the stove. Another useful piece of equipment in extremely rough conditions is a galley strap which restricts the movement of the cook and leaves you with both hands free to concentrate on the cooking. Fiddle rails and pot holders or clamps should also be fitted. The fiddle rails prevent pots and pans from sliding off the stove and should be at least 3 inches high but they should be used in conjunction with clamps which secure the pan over the burner so that it cannot move. You also need to ensure that the stove you choose fits the design of the cooking area of the boat itself. If you’re only going to be cooking when you’re not moving, you can buy mounted stoves which can be attached by bolt to bulkheads, decks, gunwales or rails by way of pedestal bases which will stop the stove from falling or sliding over. However, even when the boat is stationary, if the water is rough, you still need to have pot clamps fitted if you don’t want the pans to slide off. The crucial thing to remember when cooking on a boat stove is not to leave the stove unattended. Even if the sea is calm, a sudden gust of wind can compromise a boat stove’s safety so somebody should always remain with the stove when it is being used. There are many different types of stove and alternative fuels you can use for cooking on a boat. The important thing with a stove however is to ensure that the one you fit is suited to the galley area of the boat (or where you intend to cook) and that it’s suited to the style of boating you are going to be doing. In other words, a gimballed stove is going to be a prerequisite if you’re going to be cooking out on the open seas.